Why is it, when things happen the way they’re supposed to, we give a slight sigh of relief? We've gotten used to being disappointed in certain products...and for good reason. The expression “things aren't made like they used to be” has never been so true. Many brands are so infatuated with the “almighty dollar” they cut any corner to get it. TCX has been in the game for a long time...and rightfully so. They make great boots. I can personally attest to this. Continuing to progress their brand, they have introduced a few new sport boots for the Fall of 2013. First up are the TCX S-Speed WP Boots. Without even looking at the tag, these were definitely made in Italy. They look sharp! We would classify these as aggressive street / entry level trackday boots. However, these are some of the most protective boots in their class. Now let’s talk quality. It’s high….VERY HIGH! 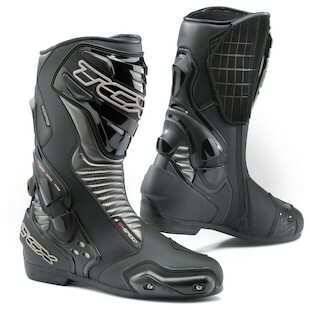 The S Speed will compete with Sidi, Dainese, and Alpinestars any day of the week and twice on Sunday. 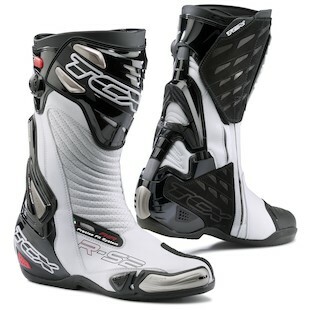 Next up are the TCX R-S2 EVO Boots. Mamma Mia! After holding these in my hands and being reluctant to give them back, I am impressed. If you’re a serious track rider, look no farther. From a protection standpoint, they rock! The only thing these are missing is an ADT Security System. But, they don’t look like a boot that was manufactured on the “mothership”. The RS2 have a technical but classic style. Comfort? We’re talkin' about comfort!? These are definitely TCX’s franchise player and we ARE talkin' about comfort. If you slip your feet into these boots, get ready to experience the Precise Air Fit System. It’s just lovely. 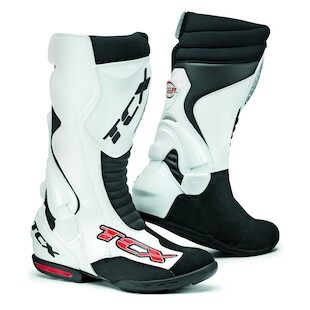 Last but not least are the TCX Speedway Boots. TCX had a specific intent when creating these boots. They decided to show a little love to the flat track riders. I would not hesitate to classify these as dirt biased dual sport boots. These boots will provide excellent comfort, rigidity, and akley protection when going flat out on the dirt track or navigating your way through the fire trails on your way home from the office. Whew! What to buy what to buy!? Thank you TCX for continuing to push the envelope. It’s nice when a product easily conveys the amount of pride a company takes in their work. They’ve got my attention.